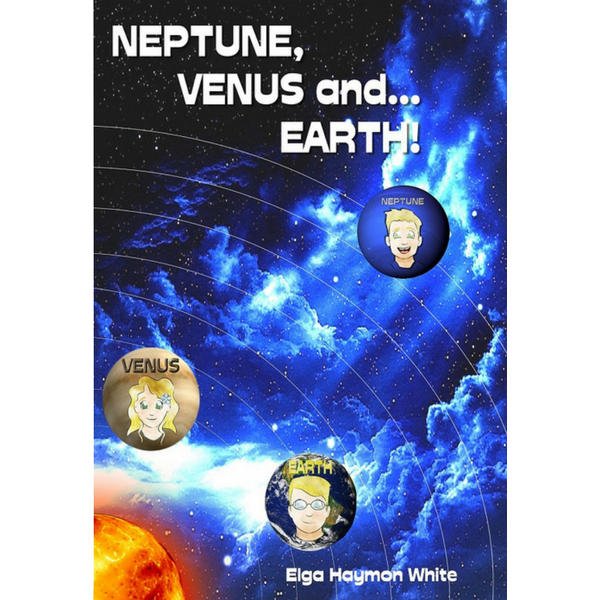 As you can see, Elga Haymon White is very diversified in her ability to bring the written word to readers worldwide. She has always got a new book forming in her mind while she and her Publisher, VicToria Freudiger, edit a current title that Linda T. Phillips is designing. Miss 'B' is well known in the Denver area and she delights in working with authors living in Colorado and Western states. As a liaison for Entry Way Publishing and Digi-Tall Media, her literary works have brought additional revenue thereby proving writing is rewarding. This book compares your home to a small business. It is written in easy to understand, everyday phrases. 'Common-Sense Living' simply means having strong family values and living by them. Learn to balance your finances, purchase a home, budget your expenses, save money and still have plenty left over to enjoy life. 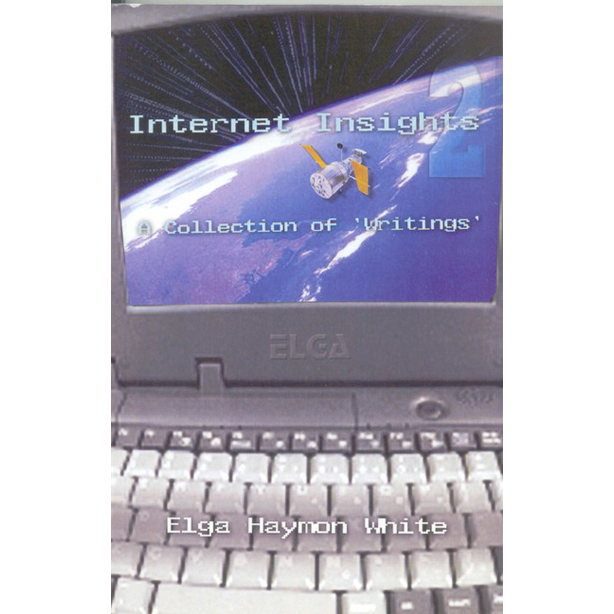 Throughout the years, Elga gathered insights communicating with people on the Internet. She relates some of the most interesting and inspiring ones in her books. You will enjoy both books, so why not buy both? Like historical fiction? 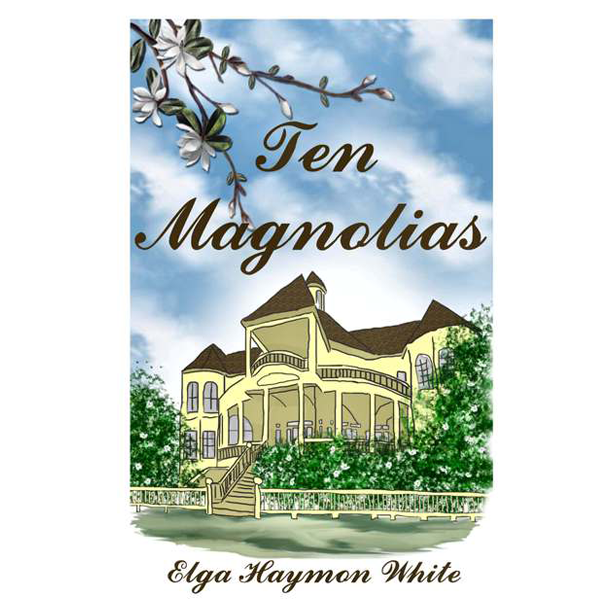 Well, if so - this book has all the qualities of the 'south' and within its ten chapters, you will meet and fall in love with Elga's interesting characters. Teens can have the most fun with Valentine's Day and other fun loving antics. See how Elga interprets teens having fun falling in 'like-love' with one another. This book also has a mysterious flair to it. Within the world of stars, starlets and other bright and wonderful visions in the Heavenlies, children will be able to experience Christmas in a brand new way by reading Sparkle and Spangle. Learn of the special letter delivered to the most lovely starlet in the Universe…discover if it was Sparkle or Spangle who was chosen by Father Time and Mother Time. See who will Reign as Queen on the Very Tip-Top of their Star Christmas Tree. With the story, along with the activity section and pages to color, children will see Christmas in a whole new way. Elga's book is perfect for holiday fun! The Christmas Duo book did so well, Elga wrote an additional book, which is fun for children learning about summer. This too, has a coloring and an activity section. Pure Rhapsody (gold) contains Elga Haymon White's poetry and prose. Her poetry is written with the 'golden touch' and with the type of emotion every poet wishes to acquire. The Gold book is the complete collection of Elga's inspirational poetry. There was so much demand for Elga's nature poems that we have created a smaller version that contains poems that revolve around 'Nature'. Now introducing Book 2: Remembering-Romance-Seasons. Where do the birds go? Long awaited e-Book for children to read in order to learn more about birds. 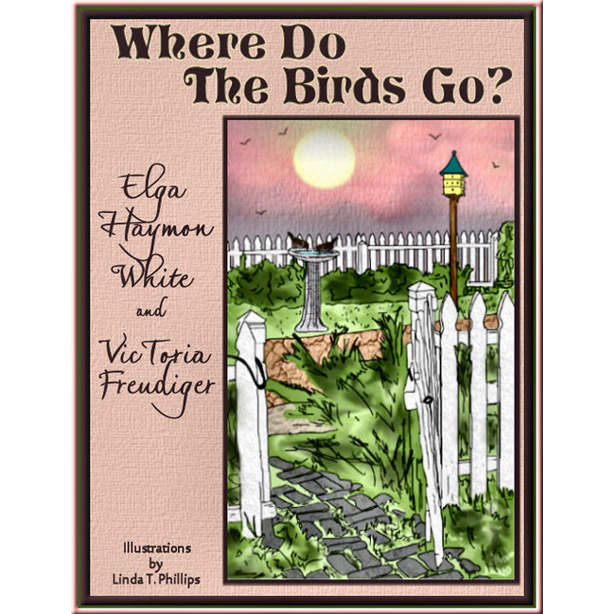 In this e-Book, publisher, VicToria Freudiger, one day in winter was looking for her regular yard bird visitors and noticed none were there. 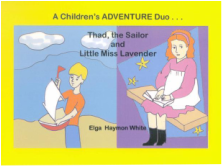 This got her creative ideas working and at that point she knew she could work with Entry Way Publishing Children’s writers, Elga Haymon White and Linda T. Phillips and they’d easily achieve a book containing both fiction and non-fiction. Book 1 contains five birds (canary, cardinal, blue and green jays, and the dove), as does Books 2, 3, 4 and 5. Each is created with fictional stories (written by Elga), non-fiction fun facts (researched by VicToria of where the birds go) and/or/activities. ATTENTION, BIRD LOVERS EVERYWHERE, especially those who work with children! The Hummingbird, Series 1 is the first of five birds focused on in the new 5-book series, “Where Do the Birds Go?” Each main book (there will be five total) are sold here on Story-e-Books.com and features five birds. Separately, we are making available adorable 4×6 prints ($2.99/ea.) and e-Book versions ($.99) of each bird in all five main books – making 25 birds in total. Also we will be showcasing the individual birds within the main book. All of the Series will contain true facts about the individual birds, with striking illustrations. 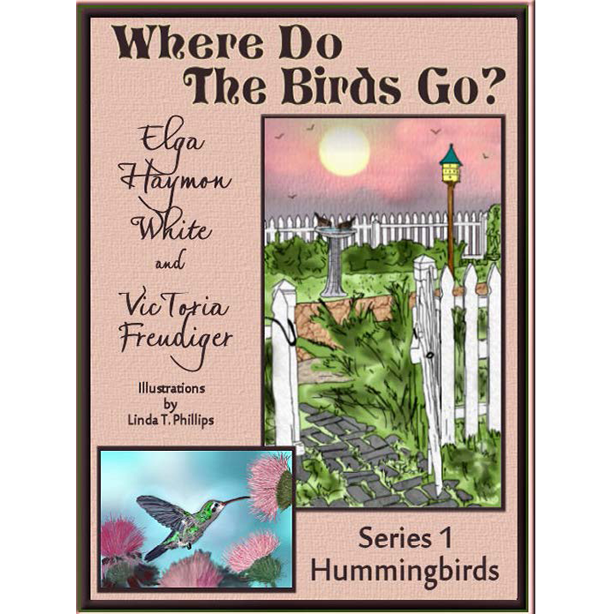 Author Elga Haymon White presents the fun fiction stories, researcher VicToria Freudiger adds true facts about each bird and Linda T. Phillip’s illustrations bring them all to life. All of the bird stories showcase a puzzle, also created by Phillips, where you pick out items that do not match precisely! ARABELLA! Oh, what a lovely thought… A ten-year-old girl and her big, white, fluffy Persian cat named…of all things — ‘Sugar’! When Tammy had the grand ‘inspiration’ of the ‘Planet Idea’ at Dusk-Time lying in the meadow, the Author was there! What an exciting time she had ‘riding the ponies’ with Neptune and Venus in the meadows and pastures. She ‘saw’ the ponies’ beautiful manes and tails flying in the wind! A remembrance of the Author's fifth grade class in her hometown, Provencal, Louisiana. This book is a nostalgic view of the activities, programs and projects that Ms. Riley, the teacher, presented to her class. The students carried out and accomplished Ms. Riley's fun ideas, thereby achieving the learning process in each of the programs. Readers may order poems to be placed in 11 x 14 frames. These poems will be typed in beautiful font on parchment paper stock. For example, in the Romance Section of "Pure Rhapsody", a reader may desire the poem "On the Romance of Your Love" to be personalized as an engagement, wedding, or anniversary gift. © 2015 Shadow Wood Writing Studio. All Rights Reserved.